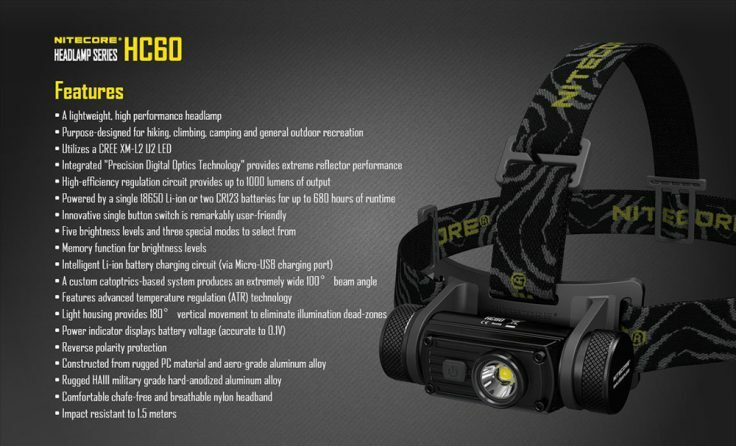 There are many possible applications for such a headlamp. Especially in camping holidays it is practical, because you have your hands free to do something else at the same time. The renowned brand Nitecore offers the model Nitecore HC60. The Nitelite HC60 is another caliber. The lamp is a CREE XM-L2 U2 LED, which should light up to 1000 lumens brightly. There are a total of five different bright modes, with the weakest setting there is talk of a running time of up to 680 hours; at full power, of course, not nearly as much. A 18650 battery is required, but it is included and can be charged via a micro-USB connection. Some “special” modes are still interesting, so the lamp can output S.O.S. signals and has a mode which is called “disorienting and immobilizing”, thus a potential attacker (whether human or animal) should deter or put out of action. Both certainly have their advantages. The list of features is long and reads very promising. The lamp is dust-tight and protected against water jets (IP65) and therefore especially suitable for outdoor use. The inclination of the lamp can be adjusted by 45° downwards and upwards, the range is indicated as 100-150m, the beam angle is 100°. All the functions should be more than enough for the next camping trip and might even be suitable for the more experienced user among us. The housing of the lamp itself is made of aluminium, the holder of plastic. 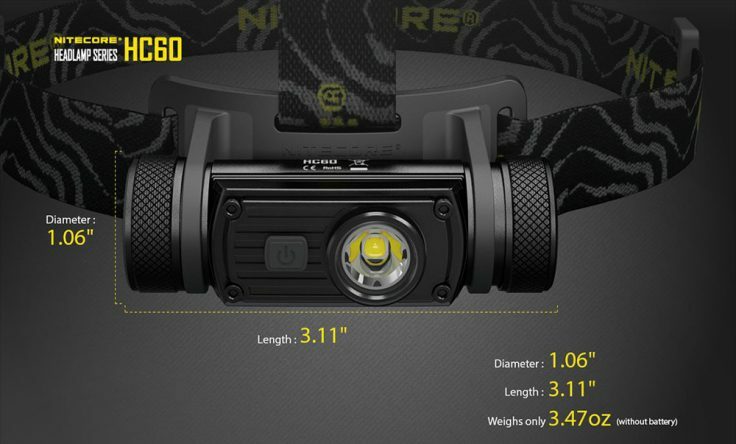 If you expect a little more from a headlight than a torch stuck to your head with an on/off switch, you can take a look at the Nitecore HC60. At least the description sounds very promising, especially since the price is damn good. All who already own such (or exactly this) lamp are cordially invited to share their opinion in the comments section.